Political insiders often say there are no secrets in Washington. That’s been especially true for the brewing trade war. Instead of developing secret plans, tweets and public speculation about tariffs fill the news almost every day. With all the publicity, it’s probably not a surprise that many companies took steps to minimize the impact of a trade war. They did this by ordering raw materials earlier than usual. Sudden demand for large ships drove a jump in shipping prices. 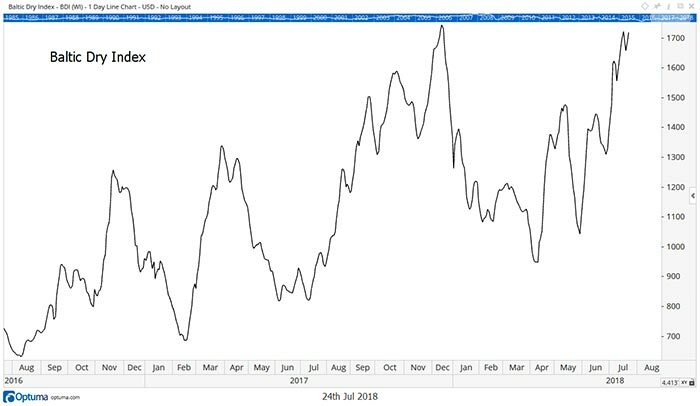 Analysts track shipping costs with the Baltic Dry Index (BDI). The BDI is a composite of the price to charter a large ship for a long-haul shipment. For example, the index includes the cost of shipping grain from ports in the Gulf of Mexico to China. The index is generally a reliable indicator of economic activity. When a building surge in China, for example, requires massive amounts of copper, the BDI climbs. Prices change quickly in response to demand from shippers and the supply of ships. But the index is volatile. That means the recent gains could be just a normal market move. To develop insights into that, we can look at the typical pattern for shippers in June and July. As talk of a trade war began, demand for shippers surged. The chart below shows the BDI reaching a new high for the year. Demand for large ships is seasonal. For example, we expect to see more grain shipments around the time of year when farmers harvest their crops. As another example, we see heating oil shipments increase in the winter when the weather is colder. A seasonal chart shows these trends. That chart style looks at the typical price change for a month by removing the seasonal effect. This is the same process government agencies use to smooth the seasonal factors in economic data. 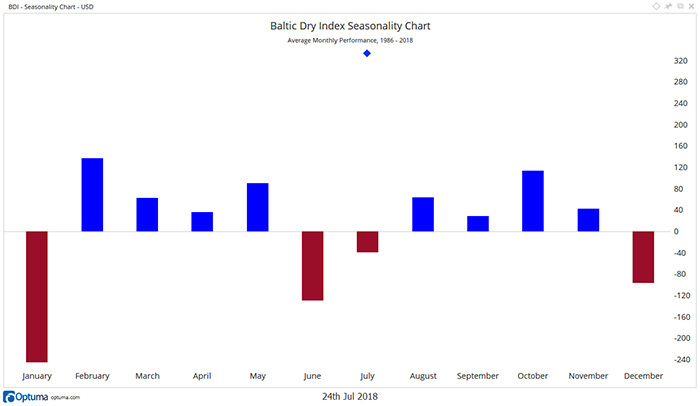 To see how the BDI usually performs in the summer, the next chart focuses on the seasonal trend. Historically, June and July are among the weakest months of the year. That means the latest price surge in the index is unusual. It shows large companies fear a trade war. They proactively moved products around the world before tariffs increase. This has important implications for the stock market. The surge in June moved shipments into the second quarter, which boosts earnings for that duration. But it comes at the expense of future earnings. That’s another reason to believe we have already experienced peak earnings. This will also show up in economic data. That means we’ll see better-than-expected reports for the second quarter. But payback will start in the third quarter, and the fourth quarter will be weaker than economists expect. This is another reason to expect a recession in the next year. The Federal Reserve triggered my recession indicator in December, and recent events confirm the economy will slow within the next year. None of this is an immediate warning for the stock market. The bear market is months away. But now is an ideal time to begin planning for that market environment.